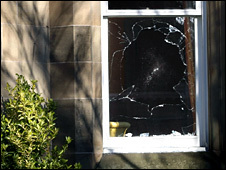 The Edinburgh home of former Royal Bank of Scotland boss Sir Fred Goodwin has been attacked by vandals. 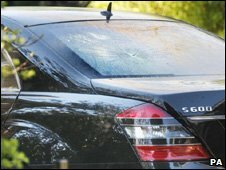 Windows were smashed and a Mercedes S600 car parked in the driveway was vandalised. A group angry at bank executives' pay contacted a newspaper claiming to be behind the early morning attack. Police said they were investigating these claims as part of their inquiry, adding that they took planned attacks "very seriously". There has been widespread public and political anger over a pension payout worth about £700,000 a year to the 50-year-old former chief executive. Sir Fred took early retirement from RBS last year after the bank needed a £20bn bailout from the government. Last month, RBS reported that it made a loss of £24.1bn in 2008 - the largest annual loss in UK corporate history. When Sir Fred stepped down from the post in October, he rejected government pressure to accept a reduction in his package, insisting that changes to the early retirement deal he had negotiated were "not warranted". The payout was described as "obscene" and "grotesque" by MPs and "unjustifiable and unacceptable" by Prime Minister Gordon Brown. It emerged on Wednesday that Treasury Minister Lord Myners has written to the Treasury select committee stating that he did know the value of Sir Fred's pension in October. He also pointed out that he had told the committee this in evidence to MPs earlier this month. It is not known if anyone was in Sir Fred's house at the time of the attack or who reported the vandalism. 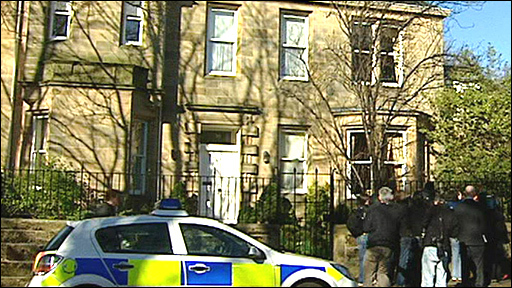 A spokesman for the Royal Bank of Scotland said short-term security arrangements had been put in place at Sir Fred's Edinburgh home, and that these were still operational during the time of the attack. The bank would not confirm what these security measures entailed. However, earlier this month it emerged that the bank was paying about £290 per month for security, which included CCTV monitoring of the house and security staff for Sir Fred. A police car is now guarding the entrance to Sir Fred's home, in the Grange area of the city. Three smashed ground-floor windows of the stone villa were clearly visible. In the driveway, the rear window of a dark-coloured Mercedes saloon was smashed, as well as the nearside rear passenger window. There were no obvious signs of activity inside the house. A statement was issued to Edinburgh's Evening News newspaper on Wednesday morning by a group which claimed it was behind the attack. It said: "We are angry that rich people, like him, are paying themselves a huge amount of money, and living in luxury, while ordinary people are made unemployed, destitute and homeless. "This is a crime. Bank bosses should be jailed. This is just the beginning." A Lothian and Borders Police spokesman said officers were called out at 0435 GMT. "Our inquiries are at an early stage and we are appealing for anyone with information about this incident to contact us," he said. "We are aware that an organisation claiming to be responsible for the vandalism had made contact with media outlets and this also forms part of our inquiry. "The force takes very seriously any planned attack on any individual or their property. "We have been in contact with the owner of the property, who was not in the house at the time, and can confirm no one was injured." Sir Fred's local MSP condemned the attack, and said the former banking boss and his family had the right to live without fear of violence. Liberal Democrat Mike Pringle said: "It is right that we have a debate over the unjustified and unacceptable pension gifted to Mr Goodwin. It is, however, wrong that his home should be targeted for attack. "The police should treat this case as they would any other crime." Why does everyone hate Fred the Shred?